We have one of the largest selections of accessories on the web, a super knowledgeable staff and expert guides to help you make an informed decision. Not only are helmets comfortable to wear while riding, they can prevent head injuries and even save your life. Now that’s a no brainer! Helmets are often categorized by seasonality based on their features. Helmets for skiing and snowboarding are designed for cold weather, keep your head warm and comfortable, work with goggles and are certified to protect you. There are also more and more multi-sport certified helmets with features like removable liners so you can go from winter to summer with ease. The following guide will take you through how to size and choose the right helmet for you. Take a soft measuring tape and wrap it around your head about 1 inch above your eyebrows and ears. Most helmets are measured in centimeters, so unless you love calculations, measure your head in centimeters. For example, if you measure the circumference of your head and it is 56 cm, you will wear a 56 cm helmet or Medium (55-58cm) depending on the helmet’s size scale. Don’t have a soft tape measure? Take a piece of string and wrap it around your head and then measure the string. After you receive your helmet put it on. The helmet should feel snug. A properly fitting helmet needs to be snug all the way around your head so that it doesn’t move around. You don’t want any excess space between the helmet and your head. Be careful to pay attention to any pressure or pain points. With the helmet on your head, shake your head around. If the helmet moves on its own or shakes separately from your head, it’s too big. Use your hand and move the helmet to the left and right, up and down. The skin of your head should move with the helmet without the helmet shifting on its own. You can choose to buckle the helmet at this point if you wish, but it will not impact the fit of the actual helmet, just keep the helmet on your head. Is the helmet too tight? If your head is feeling squeezed or doesn’t fit all the way onto your head, then your helmet is too tight. You should be able to wear your helmet comfortably all day. 5. Go Skiing, Snowboarding, Biking, Skating! All of the same rules described above for helmets apply to kids helmets. However, fitting kids for helmets can be more difficult because they don’t know exactly how to describe to you how snug their helmet feels. Be sure to pay extra attention to how snug the helmet is and if your kids complain about anything that hurts. Do not size a helmet with room to grow: if it is too large, it is unsafe. With the turn of a dial, you get even, fine tuning adjustability to make sure your helmet fit as snuggly and comfortably as possible. It’s lightweight, fast, secure, and can be adjusted on-the-fly. Dialed adjustability at the touch of a wheel or ratchet that tightens and loosens the helmet’s head fit as well as vertical adjustability. Say goodbye to that gaper gap. 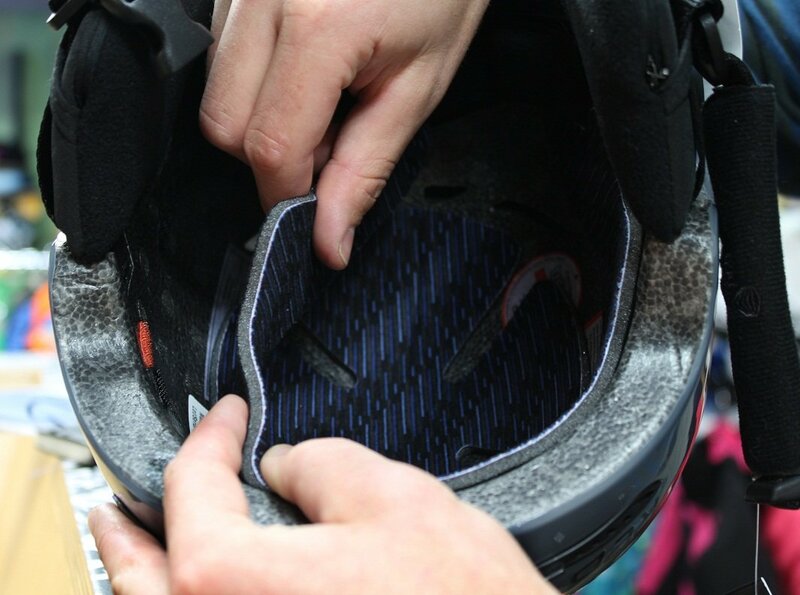 Removable pads add thickness to the interior of your helmet increasing snugness and comfort at the same time. This system is great for anyone that wants to ride with a beanie, and can also be good for children so that you can remove the pads as they grow without sacrificing safety. Air-fueled comfort in the form of a low-profile headband attached inside the helmet. 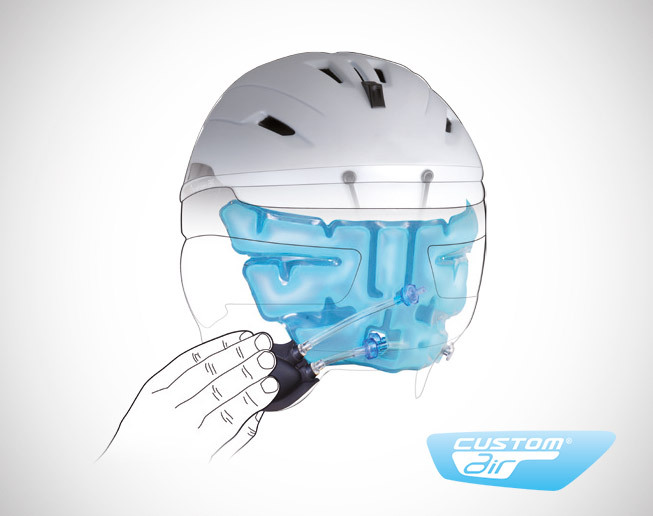 At the touch of a button, you can add or decrease air to fine-tune fit your helmet and avoid pressure points. Most helmets are designed for a single large impact. 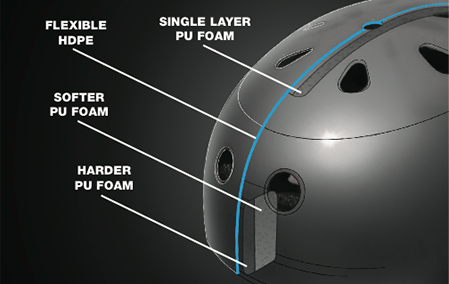 In the occurrence of an impact where the hard foam interior collapses or cracks to soften impact, the helmet should be replaced as it is no longer safe. Soft Shell (EPP) helmets are the exception, but may not be ceritified. In-molded construction utilizes a thin, hard plastic outer shell that is molded to an EPS foam liner to absorb shock. This setup allows for less rebound during impact because it will collapse under hard impact. It is also lightweight. ABS construction uses a thick, tough ABS plastic shell that is pre-formed and glued onto a pre-molded hard foam interior and liner. This design offers good protection that is still budget-friendly. These helmets are often designed for multiple, less intense impacts, but there are exceptions. Many soft shell constructions now feature 2 foam densities, with a softer foam against your head transitioning to a harder foam against the outer shell for hard impact protection. Almost all helmets have some form of open, passive venting built into their design that allows for excess heat and moisture to escape. These systems are generally simple and cannot be personally adjusted. Each company sets up their venting systems in different ways to reflect what they see as necessary. Helmets with adjustable venting systems give you the ability to open or close the holes to fit your needs depending on the weather conditions. A variety of adjustable systems are used by companies including plugs, sliding mechanisms, and one-push buttons. Choosing a specific system is mostly up to your personal preference. You want your goggles to fit comfortably with your helmet. Your goggles should fit comfortably with your goggle strap over the helmet. 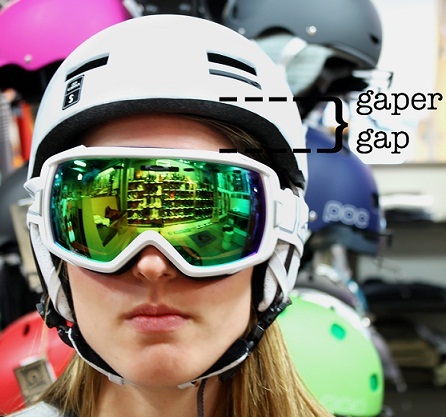 There should be no gap between the top of your goggles and the helmet; this is referred to as a “goggle gap” or sometimes “gaper gap.” Besides, “goggle gap” can give you a brain freeze. It has become increasingly popular to wear goggles underneath helmets. This is mainly for style and should only be done if the helmet fits properly over your goggles. 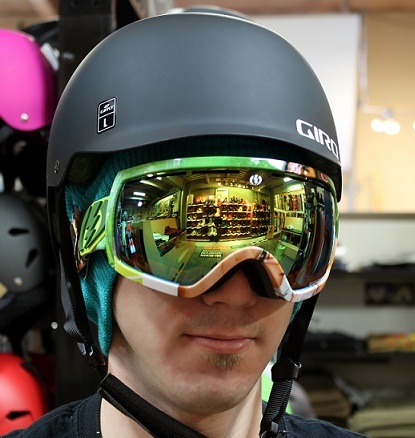 While wearing a helmet is not a requirement in most states (for adults), skiers, snowboarders, bikers and skaters are voluntarily choosing to don lids to protect their noggins. Many states require helmets for children, while many local municipalities like evo's own King County require helmets for bikers of all ages. There are three types of helmet styles: Full Shell, Half Shell, and Full Face. 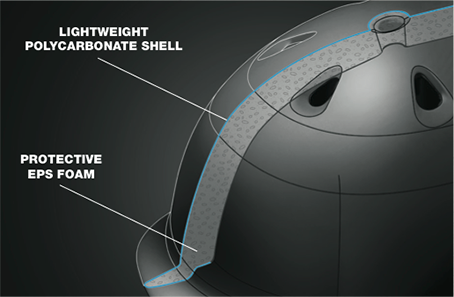 Half Shell helmets are the most popular, incorporating soft ear pad protection (in the case of winter helmets) into standard helmet design. This allows for a more comfortable fit and better hearing. 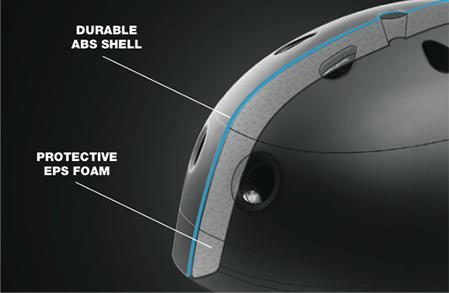 Full Shell helmets provide complete coverage and help block out the elements. Racers and sometimes halfpipe riders wear full shell helmets, and kid’s helmets are often full shell, too. If you go fast and hard, attempting tricks and new moves, this helmet provides full ear coverage that can help increase protection to the side of the head and ears. When Should You Replace Your Helmet? *Replace All Helmets Every 3-5 Years Experts recommend replacing helmets every 3-5 years of use due to the breakdown of materials (see below). (most common) "Single Impact" - Helmets with EPS constructions necessitate replacement after a single crash or drop from 2+ feet. (less common) "Multi Impact" - Helmets with EPP constructions are designed to withstand multiple mild to moderate crashes. It's important to know that most helmets are not built to last a lifetime. With the vast majority of action sports helmets using EPS (expanded polystryene) liners -- essentially plastic beads and air packed tightly together -- EPS has a tendency to compact and/or crack upon impact. This jeopordizes the protectiveness of the helmet for the next go round. Consequently, most EPS helmets are rated for "single impact." The other common impact absorbing material used in ski/snowboard helmets is EPP (expanded polypropylene). Helmets constructed with EPP liners are generally rated for "multiple impacts." Although they have a slightly lower safety threshold than their EPS compadres, EPP helmets are increasingly common amongst freestyle/park skiers and snowboarders as they don't necessitate replacement after a single crash. So if I never crash, I don't need to worry about helmet replacement? Not exactly. Most experts in the field recommend replacing your helmet after 3-5 years of use. This is primarily due to material breakdown as a result of exposure to sweat, hair products, cleaning chemicals, and exposure to the elements. Many companies -- like Giro, Bern, & Smith -- have crash replacement programs that are worth your consideration when buying. These programs typically involve a significant discount on a replacement helmet after being compromised by a fall. Regardless of these programs, it's important to note that while helmets might seem expensive, they're certainly cheaper than the potential medical bills and life-long trauma caused by an otherwise preventable head injury. 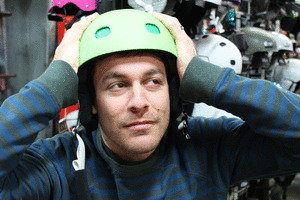 There are three main bodies that test helmets for safety: the American Society of Testing Materials, International (ASTM), the European Committee for Standardization (CE EN), and the CPSC (Consumer Product Safety Commission). Requires that these helmets pass positional stability (roll off) and strength retention tests. Helmets are tested for blunt impact protection, sharp and pointed object penetration, chin strap resistance, area of coverage, field of vision and clearance between the head and shell. Helmets are tested for field of vision, shock absorption, and retention. Focuses on greater impact protection and provides performance criteria for chin bars on full-face helmets. Impact Protection Standard for rock fall.